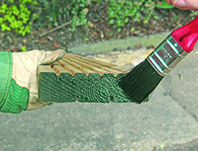 ENSELE - Brush-on end grain preservativeENSELE is a waterbased, end-grain preservative specifically designed for use with TANALISED timber or TANATONE treated timbers. Whenever TANALISED or TANATONE treated timber is cross-cut, notched or bored on-site, the exposed surfaces must be re-treated with ENSELE end-grain preservative to maintain the integrity of the protective system. Brush-on, end-grain timber preservative for the retreatment of cross-cut, notched or bored TANALISED and TANATONE treated timber. Colour options now available for green treated timbers, brown treated timbers and clear. Available in 1kg and 5kg can sizes. To find out more about ENSELE download the relevant documents below.